Why use laser for gums? For preventive procedures, the laser works by emitting a light, which is absorbed by the bacteria cells living in the deep pockets surrounding your teeth. 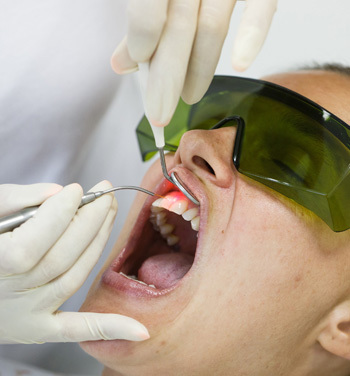 This procedure is called Laser Gum Therapy, and results in disrupting the bacterial ‘bio-film’ which causes gum disease and deep pockets, and can lead to eventual tooth loss. By reducing the number of bacteria in the sulcus (pocket) of the gum, the tissue heals and pocket depth will be reduced. The laser transfers the heat and light energy into microscopic spots that help to minimize inflammation. The laser clots any bleeding, which promotes faster healing and reduces infection in the area. It sanitizes the areas as it works! This procedure is virtually painless and requires no freezing. The leading edge technology of the Diode Laser is just one more way that we’re making your visits to Almadensmiles more comfortable while increasing the level of care we provide. Another use of this soft-tissue laser is for surgical procedures. The laser’s energy, at the surgical setting, can aid the dentist in performing surgeries, which result in very little or no bleeding. It removes tissue, clots it and sterilizes it at the same time as promoting faster and more comfortable healing. This is a major benefit of laser over other conventional methods of surgery, and it produces tissue that is healthier. Laser has a desensitizing effect on the tissues, and therefore, the procedures tend to be associated with minimal post-operative pain. At Almadensmiles, we provide laser gum surgery at no extra charge for the comfort of our valued patients. The laser also promotes healing for infected or irritated tissues. The resultant healing is less complicated and often shorter when compared to traditional techniques. The laser treats and reduces inflammation, and promotes healing of cold sores and blisters. It speeds up the healing process, numbs the area, minimizes the pain and through multiple applications, can reduce the severity of outbreaks in the long run. © 2015-16 Almadensmiles All Rights Reserved.